After graduating from Bryn Mawr, Megan Burker ’02 went on to Stanford University. She quickly made a name for herself on the lacrosse team, including becoming the first player in the team’s history to be named an IWLCA National All-American. She led the Cardinals to three conference championships, started every game of her career, and was named the team MVP in 2005 and 2006. 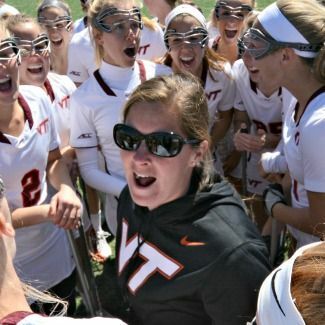 Burker captained the U.S. National Teams Developmental Squad from 2006 to 2008, then became the assistant women’s lacrosse coach at Virginia Tech. She was named head coach in 2011. I started playing lacrosse in sixth grade. I liked the challenge of learning something new, and lacrosse combined a lot of what I had learned in other sports. When I went to college, I chose to play at Stanford because I was afforded the opportunity to make an impact on the program and to be a leader from the beginning. As a freshman, I was empowered to run our offense and had to face the pressure that came with that. This prepared me to enter the coaching world with confidence. As the head women’s lacrosse coach at Virginia Tech, I essentially run my own business. We have a lot of support, from nutrition to academics, strength and conditioning to sports medicine. This requires a lot of communication and planning to ensure that everyone is aligned with my vision for the team, and that they all support how I run my program. I am responsible for ensuring that my support staff complies with NCAA and university rules, and that they interact with my student-athletes in a way that fosters discipline and focus, and that garners positive results for their athletic and academic performance. For me, the different roles and responsibilities that I fill keep my job exciting and inspiring. At Bryn Mawr, I was consistently challenged in both academics and athletics. I had great mentors in every sport I played, which inspired me to stay involved with sports at the collegiate level. Having a Bryn Mawr education certainly helped to make my academic transition to Stanford very smooth. I also appreciated the open environment at Bryn Mawr, where I developed strong relationships with my teachers and coaches. Because of that, I am comfortable asking for feedback about my performance on the field, in the classroom or in the office. I was also lucky to be in a great class with an eclectic mix of personalities. It was never “cliquey,” and I was friends with girls in many different groups – girls from my classes, the lacrosse team, the basketball team and so on. I always appreciated the diversity of our class, and the respect that existed for one another. It’s something I emphasize on my team, and that I consider one of the pieces of my Bryn Mawr experience for which I am most thankful.